2nd Annual Psychic Sasquatch Gathering in British Columbia on October 13th! The 2nd Annual BC Psychic Sasquatch Spiritual Gathering will be held on October 13, 2008 at the Crescent Valley Community Hall in Crescent Valley (near Nelson) BC from 1:00pm – 8:00pm. Tickets will be sold at the door but please RSVP through the Eventbrite link below so that we can be sure to accommodate everyone with meals and seating. Thank you and hope to see you soon! Join us as our presenters share knowledge about the sentient and psychic Sasquatch People and their message of Peace, Love, and Healing for Humanity. 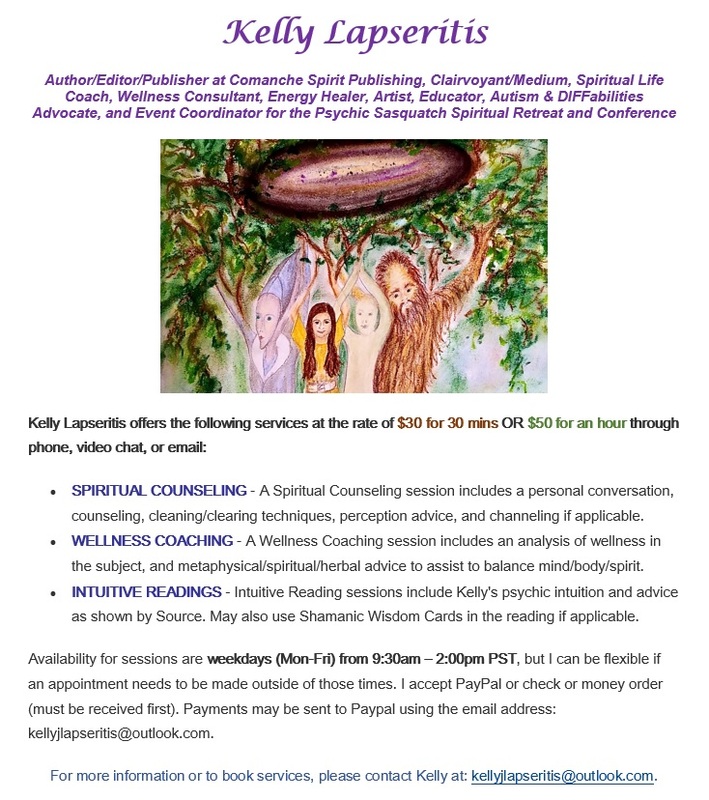 Topics include the Sasquatch/ET Connection, Interdimensional and Quantum Resonance, Holistic and Energy Healing, and Connecting with your Spirit Guides and Ancestors. A sharing circle will take place after dinner as well. There are no accommodations available for the night, so please plan your trip accordingly. Welcome all friends of the Sasquatch People! Spread the word and bring your friends. For more information, visit http://www.PsychicSasquatch.com/Events or contact SunBow at http://www.ScenicSasquatch.com. LOCATION: Bindu Studio at 5676 Winlaw Bridge Rd. 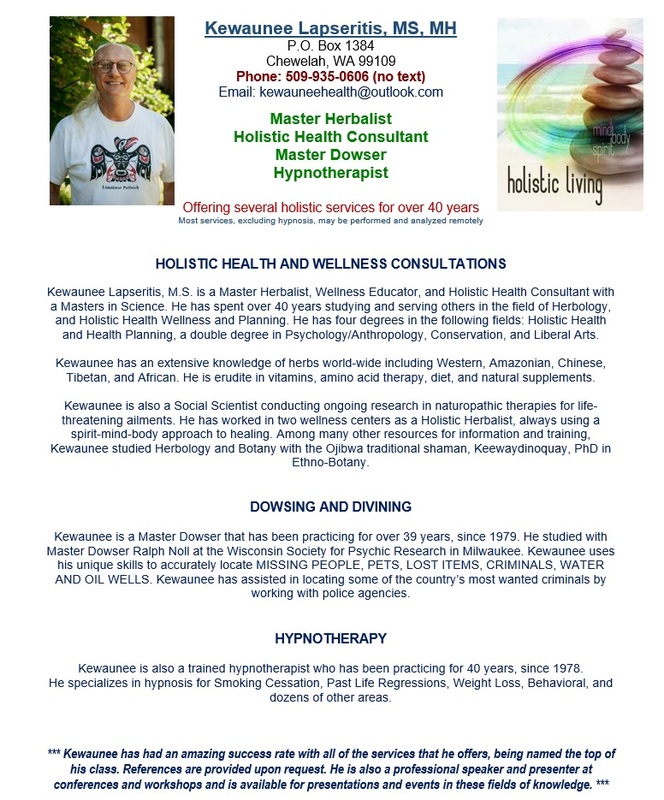 DETAILS: Kewaunee will be teaching a primer intensive class on every level of dowsing/divining from his 39 years of experience as a professional Master Dowser and Diviner. In this workshop, you will Learn the proper ways to “think and ask” when dowsing as well as how to map dowse and find any kind of person, place, or thing anywhere in the world. Comments Off on 2nd Annual Psychic Sasquatch Gathering in British Columbia on October 13th! The 3rd annual edition of the Psychic Sasquatch Spiritual Retreat in Chewelah, Washington, last weekend, was a fantastic success and such a wonderful magical gathering! High consciousness shamanic ceremonies, interdimensional healing practices and interspecies communication at their best, with an amazing growing international community of experiencers, teachers and seekers, make this unique event exceptional. Thanks to all for the uplifting and profound sharing of heart wisdom and spiritual gifts. It would be too long to list all the inspiring teachers and great folks met or to repeat all the interesting stories heard during those four days. The best I can do is to share my own version of the event, including experiences shared with a few in more intimate circles. Among the 222 participants in the event, others surely have many more stories to share. Some stories were shared and posted on SCENIC before, and we hope more are coming. We arrived on site early on Thursday, with Shekinah and Sequoia, from our area in BC. After walking the grounds and setting up camp, the next hours were spent in joyfully greeting friends arriving on site, some to happily reconnect with and new ones to meet. At night, about eight of us were standing on the edge of the woods when I saw eyes shine and felt Sasquatch presences. I mentioned it to Brian next to me and we went into the woods to see many of them standing in the trees; we heard knocks and footsteps. Returning to the group minutes later, Gayle saw eyes shine at the same place I saw them. She communicated with a Sasquatch matriarch; we all heard and/or saw them near us. A group encounter on our first night was a wonderful start to the gathering, as for most of us the deepest contacts with Sasquatch and Star Elders often happen on an intimate level, most often when we are alone; but what a great blessing to share the experience of an encounter in a group, especially with awakened souls, aware of spiritual dimensions. The next morning I conducted the opening ceremony in the field, nice circle to connect, chant and invite all our relations to join us in this sacred celebration that was starting. During the ceremony, Derrell took photos and rainbows appeared on some of them. Being specially gifted with capturing orbs and other interdimensional beings on photos, he took and shared nearly 1400 photos posted after the event showing orbs and more. Others also have shared photos and footage contributed to a collective album. The workshops started on Friday until Sunday, with two sets of six simultaneous classes happening in different locations on the site. Some workshops were repeated, to allow more people to take part, while some teachers gave different workshops in their series. Every morning started with a circle in which presenters were announcing their activities. All teachers present carry unique spiritual gifts and rare knowledge that is too long to detail in this post, but each workshop was well worth attending and a great experience. Garrett of Navajo Illuminations with his light body activation or the sound bath with the Chinos, with gongs and crystal bowls, took us on high cosmic journeys. I first went to Clifford Mahooty’s class and was amazed to hear how his Zuni ancestral teachings confirm the information from The Sasquatch Message to Humanity in details, from the succession of star hybrids on Earth, to how Sasquatch connect with Star Elders. Great blessing to see how this wisdom keeper and co-founder of the Star Knowledge Conference agrees with our message as well as in expressing doubts concerning some of the most famous figures of the so-called ‘disclosure movement’, who are compromised. The energies and conversations were at highest levels. Friday afternoon after Christina, I gave the second talk on Multidimensional Shamanism, in front of a wonderful audience. Elder Kamooh had told Gayle on her way there to do a healing session on me. With our sisters SuSun and Carissa and assistance from our brother Raven from Australia, they performed deep healing and intense cleansing of blockages and old wounds in my aura. Crystals, feathers, smudge, drum, sounds, toning, chanting, and hands worked together. It was the most powerful healing I ever received, that kept me floating, light as a feather. On Saturday morning after circle, I went to the Rainbow activation workshop given by Carissa and SuSun, that was a very enlightening reminder on channeling our light body, and useful techniques to activate it to heal with this ever present spiritual energy within. Between highly interesting sharing and conversations the day went fast, intense again. In the afternoon Hale took an interview with me for the documentary he is putting together. After dinner, I conducted a spiral dance ceremony to invite all our relations in our circle. Many orbs showed above and around us on photos. The next highlight for me was at dusk, when Marcus came out of Christina’s workshop on removing filters and clearing our lenses. He had told me when visiting my place a week earlier that he has had contacts with the Wodewose (Sasquatch in England) since five years, but had never seen anything and wished to. While talking to me that night, within ten minutes he saw four space ships appear just for him, faster than I could catch. Later, while talking with Hale, a nice bright lenticular saucer ship flew by, leaving a path of light behind. After singing back and forth with a coyote pack for minutes, I felt to go join others at the amphitheater in the woods, where our interdimensional family likes to meet with us. There was about eight of us there when Shakara spotted activity in the woods and started channeling light languages, making them appear to us once again. It has been a few times by now that I have witnessed her call them out into our clear sight. So we had another intense group encounter there, where many of us saw and heard many of our interdimensional family. Everyone’s experience is unique and too long to detail. We started walking toward them, arms opened for hugging; they retreated in the woods. They told me to sit still on a log, while others kept walking, so I did and turned around to see they were right behind us, having me tell the others that there was no use trying to chase them in the woods at night; they manifest to us where, when and how they see fit. There were also Star Elders among the crew that had just landed, including four tall white beings who let me see them. Orbs were also flying around, some within our visible range. We spent most of the night meditating and talking there. I received downloads of sacred geometry symbols and advanced star ship technologies, to process. A couple hours later, three of us were left there sharing stories of our Sasquatch guides. We heard loud footprints walking right next to us and all noticed a Sasquatch was there. I felt and said I knew him and after he called us on the trail, I saw and said it was Kamooh, to which sounds of cracking branches answered from where he stood, followed by shuffling in the wood shed and knocks on another tree behind us. I turned around to see two ghostly ten and twelve foot tall silhouettes standing near us, who turned out to be Rafael and Arrrie, Eric and Brian’s respective guides we had just been talking about. I saw many clans and tribes standing behind them, as these Sasquatch Elders stand for many of their people and have gathered us in this convergence for cosmic disclosure. Then I called Kamooh who answered instantly with a clear gentle grunt ten feet away and I said ‘thank you’, to which he answered by a happy wood knock we all heard well. This special group encounter was probably the highlight of the event for me, yet not the only enlightening experience of that exceptional gathering of high consciousness family. On Sunday, I was floating around in blissful ecstasy from an inspirational connection to the next one. Cindy Carter also took a filmed interview with me and others, to be posted. A couple days earlier, she took a photo of me at the amphitheater on which Kamooh can be seen in the background over my head, peeking from behind a tree. Some people have noticed and highlighted other Sasquatch in this photo as well. There are much more precious memories from that event that I can recall or share here. Others will also keep sharing their stories here and elsewhere in this cosmic disclosure. Big thanks and congrats to Kewaunee and Kelly for the remarkable organization of this event, that is becoming a growing international movement, with possible ramifications being planned elsewhere. The next one will be our second edition in BC, in October. We stand at this turning point of our evolution where the next quantum leap for our collective consciousness consists in opening to the interdimensional awareness and to the understanding of the vastness of our cosmic family. Experiencers might be called woo woos by some, yet they carry the sacred knowledge needed for bridging our Human reality with other intelligent sentient species of two-legged relatives having a greater experience in soul evolution and a higher spiritual wisdom, to help us on our planet. We are pleased to announce that Randy Billings will be offering a Spirit Drum making workshop in the afternoon on Sunday, September 2nd at the 2018 Psychic Sasquatch Spiritual Retreat! He will also be bringing pre-made 14″ drums for sale and Melysa Ann Fieffer will also be offering her amazing painting services for the hides. Randy will be bringing 14″ drum frames as well as a variety of animal hides to use in the drum-making class which will last approximately three hours on Sunday afternoon. Randy requires a $50 deposit at least 2 weeks prior to the event (by Aug 15th) for anyone that wishes to attend the drum making workshop so that he has enough supplies and time to prepare. If you wish for a personal painting on it by Melysa, that will cost an extra $100-$125 depending on the amount of work. OR you may contact him by email at gulliverbill@yahoo.com or call his cell at (425)293-9345 for any questions you may have. If you wish to have him make a personal spirit drum for you before the retreat so that it can be used at the gathering, you may also contact him to make these arrangements. If you are unable to send a check or money order for any reason, I am also accepting Paypal payments for the deposit at kellyjlapseritis@outlook.com which I will forward to Randy. Included in this post are photos of a previous drum-making workshop as well as a beautiful raven and sasquatch design painted by Melysa Ann Fieffer.